Watermelon, as its name would imply, is an excellent source of pure water. It use as a medicine has focused on primarily its diuretic effects. New research indicates that drinking watermelon juice is a perfect after workout remedy to reduce muscle soreness. Watermelon is an excellent source of the amino acid citrulline, which the human body will convert to arginine and also to nitric oxide – a key regulator of blood flow. Available as a dietary supplement, citrulline is showing benefit Alzheimer’s disease, dementia, fatigue, muscle weakness, erectile dysfunction, high blood pressure, and diabetes. Many of these effects are also achieved with arginine supplementation. The advantages of citrulline over arginine is that it provides a more prolonged boost in blood arginine levels. By boosting arginine and nitric oxide levels, citrulline supplementation is thought to improve athletic performance by helping muscles get more oxygen and nutrients. This effect also means improved recovery from exercise. In a small study conducted at a University in Spain, researchers monitored seven athletes after they exerted maximum effort on a stationary bike. On different days, the athletes were supplied with 500 ml of natural watermelon juice (1.17 g of citrulline), enriched watermelon juice (4.83 g of citrulline plus 1.17 g from watermelon), and placebo. 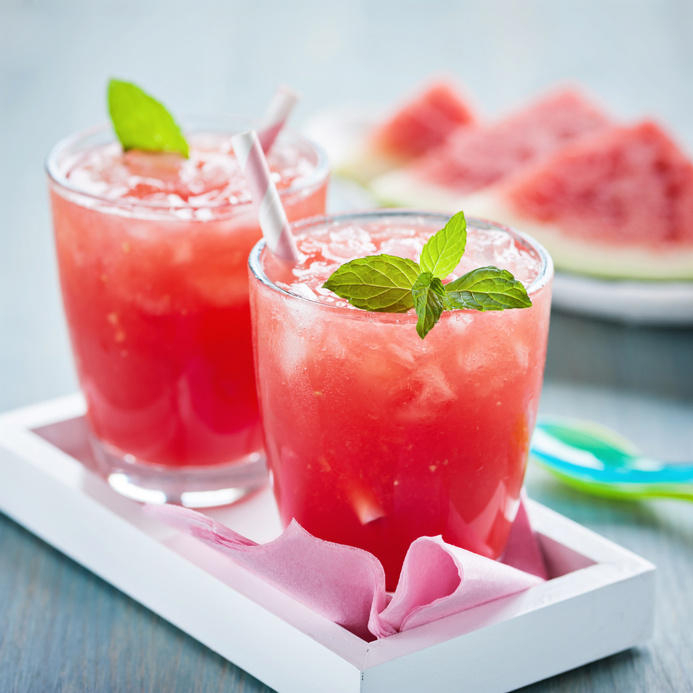 Results showed that both of the watermelon juices helped to reduce the recovery heart rate and muscle soreness after 24 hours compared to the placebo. The study seems to indicate that the citrulline may be better absorbed or utilized from watermelon compared to taking it as a supplement. In another part of the study, the researchers used a laboratory model to compare the absorption of citrulline from unpasteurized or pasteurized watermelon juice compared to citrulline as a supplement. The results showed that bioavailability of citrulline was greatest in the raw juice compared to either the pasteurized juice or the solution containing citrulline. These results again make a strong case for the advantage of drinking fresh fruit and vegetable juices. Tarazona-Díaz MP, Alacid F, Carrasco M, Martínez I, Aguayo E. Watermelon Juice: Potential Functional Drink for Sore Muscle Relief in Athletes. J. Agric. Food Chem. 2013;61(31):7522–7528.